What better time than the holidays to plan a romantic getaway in Arkansas? Our “Unplug and Unwind” package is just what you need for this time of year. 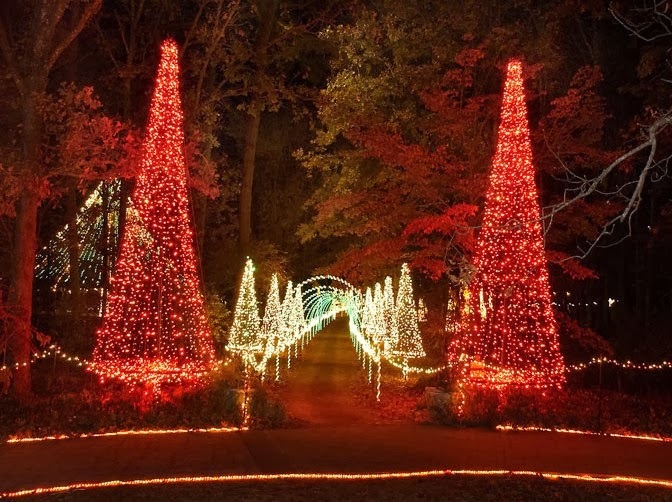 From November 23-December 31, 2013, relax for two nights in the room of your choice, rejuvenate with a spa basket with locally made soaps, refuel with breakfast at Tiffany’s each morning, and rejoice with two tickets to Garvan Woodland Gardens 2013 Holiday Lights! I don’t know who counted, but the amazing lighted spectacular at Garvan has increased from 2 million to 4 MILLION LIGHTS this year! Displays range from serene natural settings to lively animated butterflies, Santa’s house and Candy Cane Lane. A 50 foot tall Christmas tree lights up to syncopated music, and the life sized train engine calls everyone to climb aboard! Various concerts are scheduled throughout the Christmas season – some take place in the Gardens, and others will be in the magnificent Anthony Chapel. Holiday Lights is a wildly popular event, so if you want to try to avoid huge crowds, Fridays or Sundays are best. If you must go on Saturday, plan to arrive early. Spend the afternoon enjoying the beautiful scenery, and then you’ll be there when the lights are turned on! During Holiday Lights, the gardens are open from 12pm – 9pm, and the lights come on at 5pm. The gardens are closed on Thanksgiving Day and Christmas Day. This entry was posted in Events, Hot Springs Attractions, packages, things to do in Hot Springs by admin. Bookmark the permalink.